When shooting targets at extreme distances (like 2000+ yards), you’ll quickly uncover some new obstacles. A few factors that could be safely ignored inside of 1000 yards become critical to getting rounds on target. You’ll face new equipment challenges that may not be obvious at first glance. As your bullet’s time of flight extends up 3 seconds, and possibly even up to 6+ seconds, priorities shift. Everything is important, but to differing degrees. In this post, I’ll start by focusing issues you’ll face surrounding optics. That certainly isn’t the biggest challenge when it comes to ELR, but there are some significant obstacles you have to address when it comes to optics to be able to send rounds way out there – so it’s a good place to start. There are also several products on the market that can help you overcome those challenges, and I’ll highlight some of those in this post. In subsequent posts I’ll touch on several other aspects you might need to consider in ELR. When shooting targets that are two miles or more away, you intuitively think the problem would be seeing the target … so perhaps you need lots of magnification. But that isn’t it. If you’re aiming at 1-2 MOA targets, it’s not a struggle to see those out to 3,000+ yards with 25x magnification and hits can be made with much less. 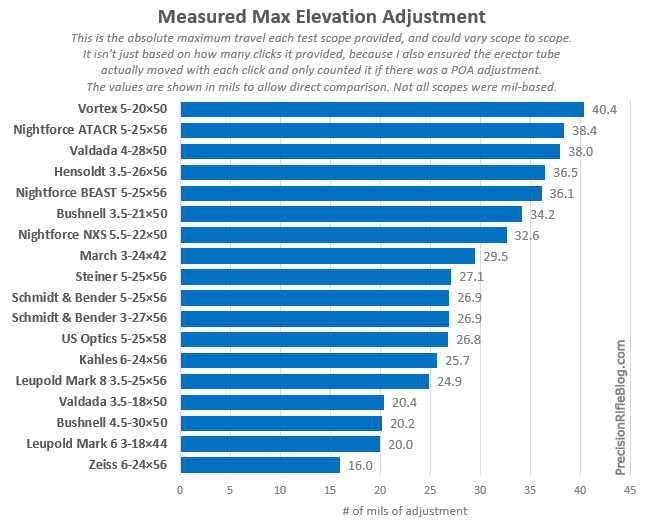 The primary issue related to optics is having enough elevation adjustment to dial and/or hold the necessary correction. At extreme distance, the bullet has slowed way down and the amount of drop becomes so excessive that you have to get creative in how you correct for it. One way to wrap your head around the vast difference, is to compare it to something many of us are more familiar with. If you look at the ballistics of a 6.5 Creedmoor between 500 and 1000 yards the average drop is 4 foot for every 100 yards. Now, if you compare that to the ballistics of a 375 CheyTac at extreme range between 3000 and 3500 yards, the average drop is 43 feet per 100 yards – 10 times more! The CheyTac bullet is still traveling around 950 fps way out there, but it is dropping fast! It roughly takes 5 mils (16.5 MOA) to adjust from 500 to 1000 yards for the 6.5 Creedmoor, but it takes 15 mils (50 MOA) to adjust from 3000 yards to 3500 yards! Honestly, with a mid-sized 6mm or 6.5mm cartridge like the Creedmoor, it’s rare to find yourself dialing more than 10 mils of elevation (roughly 30 MOA), because that covers you out to around 1200 yards and those mid-size cartridges shine inside of that range. However, cartridges like the 375 CheyTac and 416 Barrett are being used in ELR to reach out to 3000+ yards, which is closer to 30 to 40+ mils of elevation (roughly 100-135+ MOA). A couple of years ago I did a massive scope test where I thoroughly tested the 18 most popular tactical scopes in the $1500+ price range. I measured the total elevation travel on each scope, and those results showed the majority of scopes used for long range shooting have 20-38 mils of total elevation (66-128 MOA), with most being around the middle of that range. 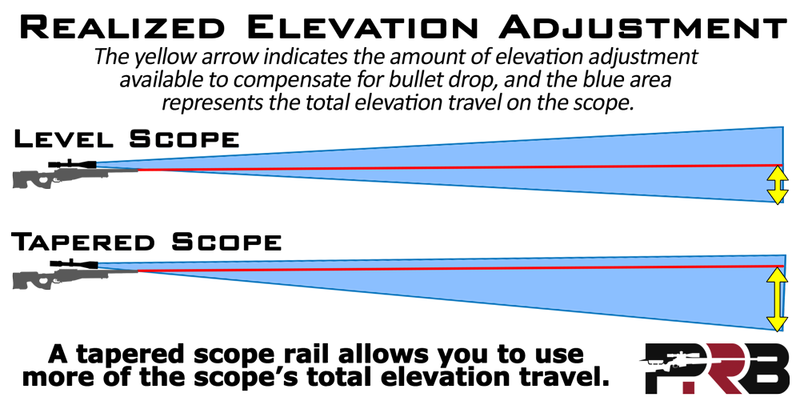 You can see in the diagram that a level scope only takes advantage of about 50% of a scope’s total elevation travel. The usable elevation adjustment is indicated by the yellow arrows, and the total adjustment is indicated by the blue area. On the level scope, the other half of the travel is in the opposite direction of gravity, and won’t ever be of use. What a waste! But, when you use a tapered rail and/or mount, you are simply tilting the scope forward so more of its internal adjustment range is usable. This moves your zero from the middle of the travel closer to the edge of it, and there is less wasted adjustment. This can allow you to employ 70-95% of the total elevation a scope offers, depending on how well you match the taper of the rail and/or mount to your scope. I mentioned in a previous post about my 300 Norma Build that my Nightforce ATACR 7-35×56 F1 scope on that rifle measured at 37.0 mils of total elevation travel available. I carefully paired that scope with a tapered rail and mount so that I’m able to use 36.3 mils of that, which is 98%. I have just 7 clicks below my 100 yard zero! I’ve been accused of being a bit of an extremist … so don’t feel like you have to be that exact. But I do know two veteran shooters who machined a custom rail for their ELR rifle so that it was exactly to the click at the bottom of their elevation travel. One is them is John Buhay, who just placed 2nd in King of 2 Miles. I’m not saying it’s worth the effort to do that, but then again … they don’t call it Extreme Long Range for nothing! Now that we understand the primary problem with optics, I’ll point out a few products that can help you get the most out of your scopes mechanical adjustment. If your action has a removable rail, then you might be able to switch it out with one that has more taper. There are many options out there for actions based on the Remington 700 footprint and other popular actions, like these rails from Nightforce that feature 20 to 40 MOA of taper. You can find custom rails in sizes like 30, 50, or 60 MOA, but the price for those more niche tapers is usually higher. 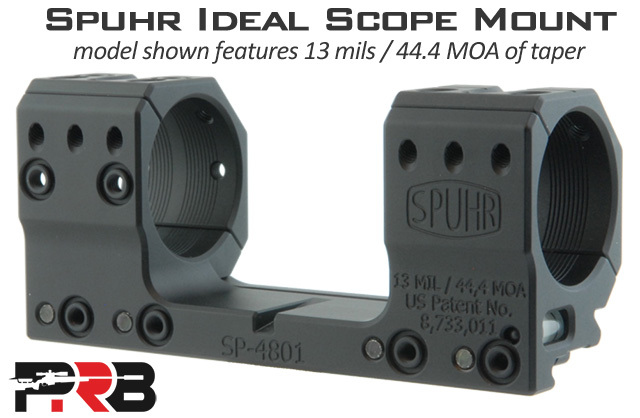 Other companies make good tapered mounts too, but I mention Spuhr because they’ve earned my trust, I see a lot of top shooters trusting them too, AND they offer so many options to help you optimize your scope setup. The ERA-TAC adjustable mount allows you to adjust taper in 10 MOA increments from 0 to 70 MOA (roughly 20 mils). This is the mount I use on my 300 Norma Mag, and it’s pretty ideal. I’d definitely buy it again for that setup. At first I thought an adjustable mount might not be as solid as a fixed mount, but this thing is rock-solid. I used it to place in the top 20 at the Wyoming ELR PRS match last month, which included over 120 rounds from a large magnum … and it was still zeroed … even after enduring baggage handlers on two plane rides there and two plane rides home! One benefit of an adjustable mount is that you can change your zero (say from a 100 yard zero to 1000 yard zero) based on your application, and still get the most mechanical travel possible in either case. The downside of this mount, compared to some of the other options I’ll cover, is that it isn’t designed to adjust on-the-fly out in the field. It’s more of a set it, lock it down, and re-zero your rifle setup. But’s it’s really good at that, and it’s worked well for me. 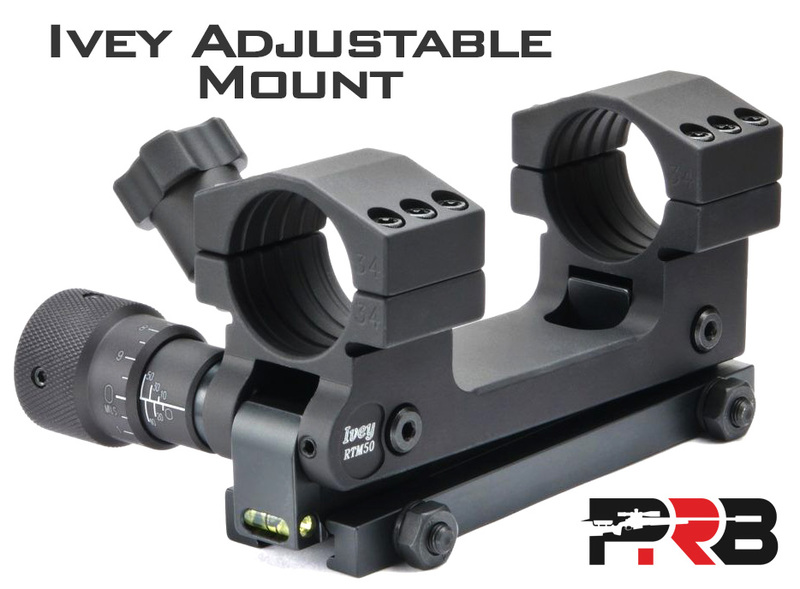 The Ivey Shooting Adjustable Scope Mount has up to 60 mils or 200 MOA of on-the-fly adjustment. The adjustment on the mount is graduated in either 0.5 mil or 5.0 MOA increments. To change settings you loosen a locking cam knob on the left side of the rear ring, then dial the adjustment you want, then tighten everything back down to secure the ring firmly in place to prevent movement from recoil. I haven’t used this personally, so I’m not sure how accurate or repeatable they are, but they look serious. I did notice Chase Stroud, a world-class shooter who has been shooting ELR for a few years, was using one (not sure if he still is). I’d bet it is capable gear if he was running it on his rifles. 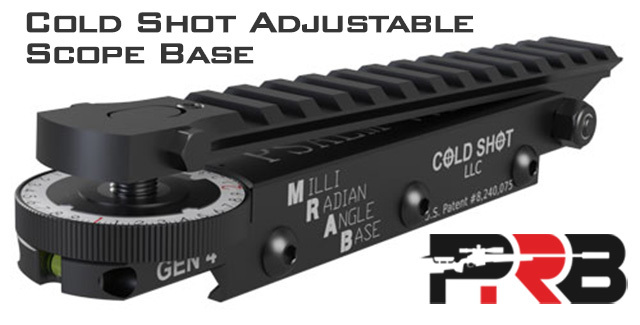 The Cold Shot Adjustable Scope Base essentially acts as a riser that you mount on top of an existing picatinny rail, and it provides up to 144 mils or 300 MOA of additional on-the-fly adjustment. Honestly, for the amount of adjustment and price, this product seems like a killer deal. Another plus of this setup is that because it’s independent from the scope mount, it seems like it’s be easier to switch from one setup to another (regardless of the scope tube size you were using). However, it does create one more interface that could slip or move under recoil, and in that way it could add some liability to shot-to-shot repeatability. The Secondary Problem: Now I Can’t See! Once you do finally get all of your scope’s mechanical elevation adjustment going in the right direction by carefully pairing it with a rail/mount, you may notice a secondary problem: Your barrel is in the way! In this game, it’s common to see barrels from 36” all the way up to 40” or more. When you combine a long barrel with a lot of cant in your rail/mount you may not be able to see through your scope because your barrel obstructs your view. Doh! The photo above is of Bill Poor, a west Texas shooter who connected with target at 3 miles back in January 2018 with his 408 CheyTac (view news story). It took him 8 shots to get on target, which is pretty impressive. Luckily Bill and his dad are talented machinists, because custom machine work like what you see on his rifles can add up quickly. But even after you have risers for the scope and cheek, you’re stuck in a bit of an unnatural shooting position, which can be a pain in the neck (literally)! You can see how far Bill is floating above the bore in the photo. At the very least, it might take some getting used to. The Charlie TARAC: An Elegant Solution To Both Problems! … And then there was the Charlie TARAC from TacomHQ! As an engineer, I love how creative and elegant of a solution this is. 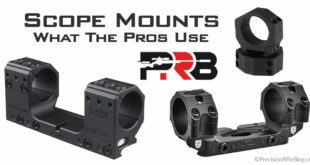 It addresses the primary problem related to having enough elevation adjustment AND the secondary problem of being able to see over the barrel. The Charlie TARAC is similar to a periscope. It shifts the image of the target using mirrors to add a preset MIL or MOA value. Instead of tilting the scope with tapered rails, rings, and risers, and having to change your cheek position, you simply attach a little device to the end of your scope and it shifts the target image optically (via mirrors) – so you change nothing! You can keep your rifle zeroed at 100 yards (or whatever you prefer), and then quickly snap the Charlie TARAC to the objective on your scope when you need to need to shoot to extreme ranges. The Charlie TARAC can be attached a few different ways (see options), but I typically see guys using their magnetic scope mount. You attach their mount on the sunshade of your scope, then the Charlie TARAC simply snaps into place and is held there with strong magnets. 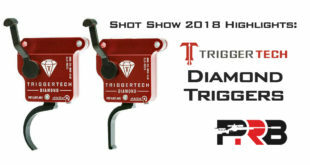 It might not sound like it’d be stable under recoil, but I’ve personally seen guys get hits with this setup out to 2 miles – so it is very repeatable. It was awarded the Innovative Product of the Year at the King of 2 Miles 2018 competition. Because it is similar to a periscope, it also helps you see over your barrel. 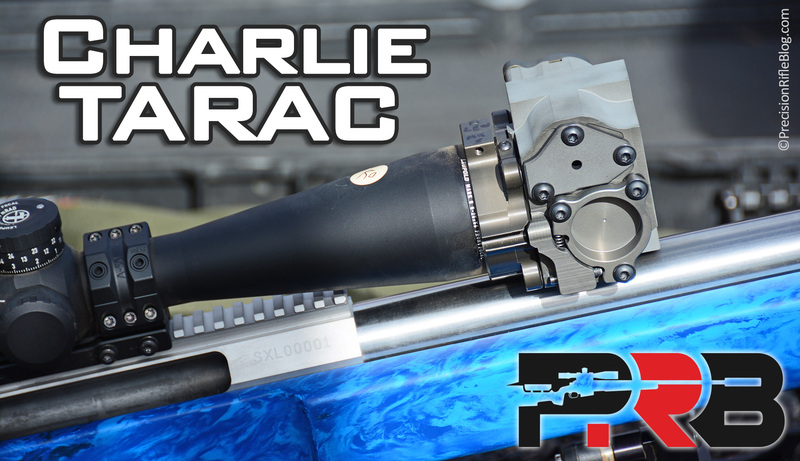 The image the Charlie TARAC captures comes from higher above the bore, so that practically eliminates the secondary issue without having to raise up the entire scope to see over the barrel. It seems to be a very clever solution to both issues. 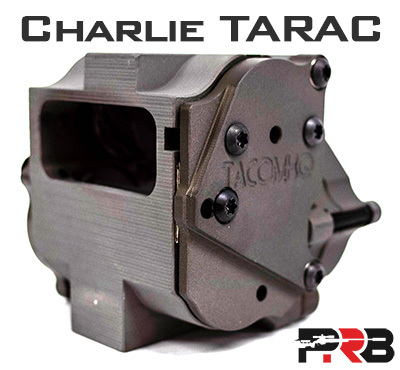 The Charlie TARAC can be set to shift the image by up to 300 mils (or 1,000 MOA). It comes pre-calibrated from TacomHQ to whatever amount you specify, or the end-user can set/change the adjustment. Adjusting the unit involves a few steps, so this isn’t something that is intended to be done on-the-fly in the field. Here is a real of example to illustrate how you might use it: Let’s say your rifle was zeroed at 100 yards and your scope had 32 mils of elevation adjustment available from there. If you set your Charlie TARAC to 30 mils, when it was attached to the end of your scope your zero would be shifted by 30 mils. So if you were engaging targets and needed up to 32 mils of adjustment, you could engage them without the Charlie TARAC attached. But if you needed 36 mils, you would simply attach the Charlie TARAC, which would shift your zero by 30 mils and then you’d just need to dial 6 mils on your scope. With this setup you’d be able to dial up to 62 mils of elevation. And for that entire range you can stay zoomed in at your full magnification, and hold dead center for elevation! What if the scope could just dial more … maybe a lot more?! 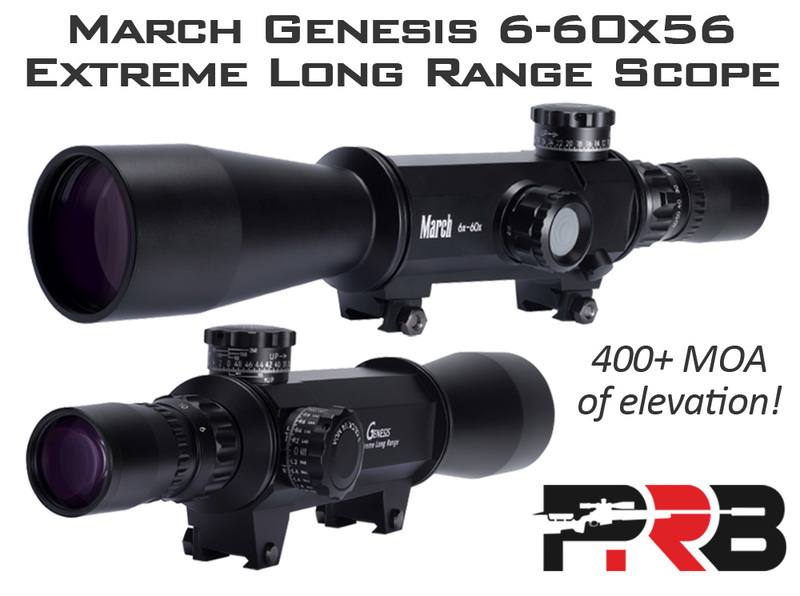 March recently released a brand new March Genesis 6-60×56 scope specifically designed for ELR, and it features 400 MOA of elevation (equivalent to 118 mils)! Doc Beech from Applied Ballistics bought one and told me he was able to dial 428 MOA of elevation! I’d bet the average scope features 60 MOA of elevation or less, really good scopes like the popular Nightforce ATACR feature 100-120 MOA, but nothing else is remotely close to 400+ MOA. I ran some quick ballistics and that would be enough adjustment to take a 375 CheyTac past 4,500 yards. WOW! Doc had his new March Genesis ELR scope with him at the King of 2 Miles competition, and I got to spend a little time behind it. The optical clarity was very good, with several other guys there being pleasantly surprised how sharp the targets were beyond 2,000 yards. I also really liked the reticle, although I’m sure some shooters may think it is too busy. Reticle choice comes down to personal preference, but this one seems very functional. Unfortunately there is only one choice, so hope you like it! I was intrigued and am always up for burning some gun powder, so I joined them. We started by mounting Doc’s March Genesis scope on Mitch Fitzpatrick’s custom rifle sporting a Vudoo action, Bartlein barrel, and McMillan stock. It had to be the most expensive 22 Long Rifle I’ve ever seen! 😉 After zeroing the scope, Mitch immediately started testing it at 400+ yards. Within a couple of minutes he hit a 1 MOA rock at 577 yards twice in a row! Time of flight of that 22 bullet was similar to the big 375 caliber bullets they were launching at 2,000+ yard targets earlier in the day, so the wind and other variables had a long time to act on the bullet. We all took turns behind the rifle, and I have to admit that while I started off skeptical of “Rimfire ELR,” it had to be the most fun I’ve had behind a rifle in a long time! And that says a lot! We shared lots of laughs as we stretched out the distance and pushed the time of flight into a few seconds. The challenge to hit a target around 600 yards or more was eerily similar to what guys were facing earlier in the day when they were shooting targets at 2,000+ yards with big 375 magnum rifles, with a few important distinctions: no recoil or muzzle blast, and the ammo cost less than $0.20 per round instead of $7.00 per round! The AB guys definitely convinced me how fun “Rimfire ELR” can be, and it seems to be a great option for guys who only have access to a range with more traditional long range distances. While I enjoyed shooting the March scope, I have to admit that in the back of my head I wondered how well it tracked. A few years ago I did a massive scope test, and both March scopes I tested had dismal mechanical performance. I measured 2.2% error in the clicks on the first March scope I tested, and thought I must have got a bad scope. So I contacted them and they sent me another scope – and it was even worse, with 2.7% error! Of all 18 scope models I tested that were in the $1,500+ price range, the tracking on the March scope was significantly worse than any other brand. After I published the results, a few of my readers ran the same tracking test on their March scopes and reported similar results. If you had 2.5% error at 3,000 yards, your bullet would land 10’ off target (based on 375 CheyTac ballistics). That is a lot! You could obviously walk the subsequent shots on target, but in competitions like Ko2M you only have 3-5 shots at each target and if you don’t connect, you are out. Some advanced ballistic engines allow you to correct for this kind of error, but that adds complexity to something that is already pretty complex. Also, most people don’t test to see how precise their click values are, and if you didn’t do that you’d likely get pretty frustrated trying to diagnose why your shots were off. I’d be very interested to hear if the Applied Ballistics team ends up testing how well the March scope tracks. I’m hopeful March has addressed the tracking issues I ran into a few years ago, because the March Genesis scope offers some compelling features for ELR. I also personally love seeing someone bring a novel product to market, so I’m hopeful they succeed for taking a risk to better serve ELR shooters. I fully expect other scope manufacturers to head down the same path in the near future, so thanks March for blazing a trail! While the March scope addresses the primary issue related to having enough elevation adjustment, it still has the secondary issue related to not being able to see over the barrel. In fact, when we were shooting the 22 LR rifle and moved beyond 800 yards, the suppressor started to obstruct our view. The length of the barrel and suppressor on that rifle was short compared to the 36+” barrels found on most 375 and 416 magnum ELR rifles, so it might be a problem fairly quickly on those setups. So even with the March scope we’re back to needing to raise up the scope, then add a check riser, and potentially being in an unnatural shooting position. So while the March Genesis has a lot of cool features, there may still be some compromises compared to a setup like a Nightforce ATACR F1 scope combined with a Charlie TARAC. It’s VERY exciting to see all the advancements being made around ELR, and I only expect it to accelerate from here. Can’t wait to see what comes next! Thanks Cal. Lots of good info, again. 22 ELR looks like a blast. I know almost nothing about proper .22 actions. The adventure begins. Thanks, Darwin. The 22 ELR thing sounded lame to me at first, but wow was it a lot of fun! Those Vudoo actions are based on a Remington 700 footprint, so that means you can use stocks and triggers designed for the 700. They just have special AICS-based magazines to feed the ammo, which worked smoother than expected. That whole setup pretty cool to me, because you can slip a barreled action into another stock. If you shoot PRS, you can train with that in your competition stock/chassis. I haven’t bought one of those Vudoo barreled actions yet, but maybe Santa will bring me one! Just built my first custom last year on a Rem 700, MDT HS3. Never thought my second build would be a 22. Ha! It’s funny that I found myself talking about the extreme edges of the spectrum (375 or 416 monsters and rimfire) all in the same article! 😉 It was A LOT of fun though. I literally shoot thousands of rounds every year out of bolt action rifles, so I spend a lot of time at the range and I’m fortunate to get to shoot with a lot of interesting people … but that was one of the most fun days of shooting I’d had in a while. The wind was blowing up to 15 mph, and we just sent round after round down range. The barrel never heated up too much that we had to stop, and honestly it cost less than $50 for all of us to shoot for a few hours. It was very challenging, and required you to really manage all your fundamentals, just like ELR. TARAC site error 404 not found? I’ve been in the long range rimfire game for years now and highly recommend the CZ455. KRG and XLR and Manners make inlets for them, they are laser accurate, can readily be rebarreled, and cost a hell of a lot less than the voodoo. Critically they are also very careful with the delicate lead noses, something most other rimfires can’t say. I’m happy to share more about my personal build if you’re interested. Awesome! I appreciate the recommendation from someone who is more familiar with that game. It seems like a lot of fun. With your time behind the Genesis did you use the higher magnifications at all? What kind of magnification did people set at for the 2 mile shots? I know Tacom is working on a Tarac with some adjustment knob ability- that seems like the best way to go. It’s taking some time though. All and all it all costs 5k ultimately- if we buy a $3500 scope and a $1500 Tarac we are in at the same as the Genesis. What’s amazing about the Genesis is that it uses a very old optical design- the same that was on the old Unertl scopes of 100 years ago. They had external mechanical adjustments, the scope itself was just optics and tube. The designs evolved into internal adjustment of the erector tube because dirt effected external mechanical adjustments. The erector tube is simply attached to some very precise screws that push against it in two planes, with springs that push across the opposite axis. That is pretty cool, but things get so tight and therefore complex and expensive. So Deon decided to go to an external adjustment gimbal like mechanical setup, I get it. I know a few guys who have one on order, no one has gotten theirs yet. Mark and Sam in Australia use the Tarac and seem to have some decent results with it. Problem is always the same though- the settings to get it lined up come down to some small allen screws and it’s hard to set up. If it had robust adjustment knob that was dead accurate, we would be in business. Amazing how everyone is going at the problem differently, hopefully by sharing experiences we will know the best way in a few years. Lots of the top guys at Ko2M were using scopes with a max magnification of 25x, like the Nightforce ATACR F1 5-25×56 or the Leupold Mark 5 5-25×56. A few of them were running the Nightforce ATACR F1 7-35×56, so they may have been bumping 35x … but most didn’t even have a scope with that much magnification. You just really don’t need that much to see the targets. In fact, if you zoom in too far you might lose the target under recoil and have to search for it. If it were me, I’d be running between 25-35 and that is plenty of magnification. I’ve hit targets at 2,640 yards at 9x … so 60x magnification might be nice to use for spotting other shooters or to read the mirage, but isn’t necessary for engaging targets. That is very interesting about the design of the Genesis. What is old is new again! It is exciting times for sure. There has never been more innovation around this space, and I feel like it’s only going to speed up over the next year or two. That would be really cool if the Charlie TARAC had an adjustable knob like you’re saying. I can’t think of a reason that wouldn’t be possible. Hopefully they can retrofit the one I just ordered! 😉 It’s always tempting to wait for the next version of something, but sometimes you also have to take the risk and dive in where you’re at. I can’t wait to try it out! John is a great guy at Tacom, he has been retrofitting everyone’s units for years now. When something new and better comes out they stand by the product and can get it to the latest spec quick. Lawrence at Cold Shot is a similar great dude, they also offer all the upgrades to the units they sell. I still have a version 1 from 2014 I haven’t sent back for the latest upgrades. Deon has been a pain to deal with over the years for me. They do all service in Japan and you simply send the scope in and months later it comes back. It’s kind of spooky actually, but they do honor warranty. Word on the street about the Genesis is that they are in fact having mechanical issues. They showed a proto at that show back in April and I think the scope you saw was also a proto. The latest version looks to have added more reinforced springs at the central gimbal to keep vibration or other issues from causing tracking errors. Wow, Chris … great info! Thanks for sharing. It’s good to know who stands behind their products. That’s something you usually don’t think about until you’re in a vulnerable position. It’s also great to hear those guys are retrofitting units. That helps relieve the pressure and risk from buying something in a rapidly emerging field. There are great products out there, but I know some guys can be paralyzed by indecision because they don’t want to invest in something and it become obsolete a month later. It sounds like Tacom and Cold Shot are going above and beyond to ensure they have satisfied customers. Retrofitting products is definitely something most companies won’t do, so it’s cool to hear. And my experience communicating with Deon (ie the Japanese manufacturer of March scopes) was similar to your’s. It left something to be desired for sure. That’s sad to hear about their potential tracking issues. Hopefully they’ll figure it out, because that seems like a critical part of an ELR scope. I appreciate you sharing your comments! They’re very helpful. 1) the S&B PM-II product range includes a number of versions with “Double Turret” which gives 35-36 Mils of elevation. I currently have 2 of them, the 5-20×50 Ultrashort and the 3-20×50 Ultrashort (which actually isn’t as short as the other one). I’m looking forward to the rest of the series. I should add my major issues with ELR (beyond the scope mount thing). A major consideration is spotting scopes although the scope is actually only a symptom. The diseases are “spotting your hits” and “spotting your misses”. There are some interesting approaches to the hits (the Magnetospeed T1000 hit indicators seem to work well), but spotting your misses is where the pain lies. If you cannot see a bullet splash in the target area then you may as well go home. Thanks for the input. Yeah, the charts I showed were really just for the 18 scopes I tested a couple years ago. There are certainly a few other models out there. I would say that 12x probably isn’t enough magnification for me. I don’t think you need 60x to get hits, but I prefer something closer to 25x or more. 20x would probably be alright, but some guys might say even that isn’t enough magnification. And you’re certainly doing a good job leading into the topics I’ll hit on in the next post. I started with optics, but that isn’t the biggest challenge in ELR. There are a lot of other reasons you might not connect with a target. I’ve brainstormed with several very accomplished ELR shooters to come up with my list, and it is pretty comprehensive. I just wanted to lay a foundation with optics, because if you can’t correct for an extreme amount of drop … spotting shots or reading wind doesn’t really matter. Once you get past the optics hurdle, there are a ton of other aspects ready to challenge you and some of those hurdles are even taller! Stay tuned! Magnification: no, 12x is a bit light. I have the Hensoldt 3-12 on an HK .308 semi-auto and it’s good enough for 950-1000m, although I find myself constantly trying to turn it past the 12x stop even at those ranges!! But the elevation range is very handy. That’s what I meant by “pushing your DMR out to longer range”. Absolutely. That sounds like a pretty sweet setup for that rifle and range. Seems obvious in hindsight that all mounts should have a non-zero cant unless in a place where a very, very strong updraft can exist. Is there a return-to-zero issue after removing a barreled action from a stock/chassis? Presume you would need to replicate the torque when re-installing. Would hypothesize any effect would be minimal with metal, perhaps more with fiberglass and most with wood or laminate. I wonder how closely external ballistics scale with time of flight? That is, does time-of-flight dominate external ballistics with the usual assumption all other variables are constant or variable but insignificant. Then for rimfire ELR, produce one ammunition with a muzzle speed of say 700 ft/sec, another with 500 ft/sec, …. The slower the muzzle speed for a given distance the longer the effective range. If muzzle rotational speed is important, a suite of barrels with different twists keep muzzle rotational speed constant. When shooting with a bipod or front rest and a bag rear rest, do you have to experiment to determine what shoulder pressure is best? I presume a WEZ for ELR shooting would require a 6 DOF ballistics engine? As always, your blog is very well written and thought provoking. Good questions, Rick. I have always thought if you remove a barreled action, you need to go double-check your zero. There may be some configurations where it is repeatable, but I don’t seem to notice that often … although I haven’t ever done any thorough testing of it. On how much pressure shoulder pressure you use, the biggest thing just seems to be consistency. I used to load really heavy, but have stopped doing that. I now load fairly lightly, just enough to get rid of any slop in the bipod connections. Some of that is because I shot PRS-style matches, and I want my POI to be the same regardless of whether I’m prone or shooting from a barricade that I can’t load. 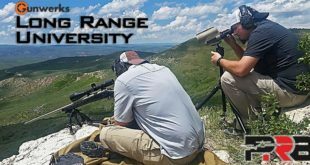 I also heard Todd Hodnett, one of the most respected long range instructors in the world, say that he used to teach his students to load heavy, but he’s changed that over the past couple years and he suggests just enough force to take the slop out of the bipod. At King of 2 Miles, virtually all of the shooters were using Phoenix Precision bipods, which don’t really allow you to load them. They have skis on the feet, and a swivel that allows the rifle to basically float without any torque on it. They also use more firm rear bags than what is common in the PRS. The rear bags are firm, and similar to what you’d find in Benchrest. I have experimented with group size using a Phoenix bipod and firm rear bag compared to my traditional PRS setup of a Harris bipod and lightweight squeeze bag … and my groups tightened up measurably with the Phoenix bipod and firm rear bag. I’d bet my 5 shot groups shrank about 0.1-0.2 MOA. The Phoenix bipod and firm rear bag made my POA noticeably more stable on the target. Now when you get to predictive ballistics and modeling way out there, you meet several new obstacles. One thing that is virtually impossible to model is dynamic stability … but I won’t chase that rabbit right now. That is exactly what I will get into in the next post. Stay tuned! Glad you found this one interesting, Rick. Like most things, there is a lot more to it than you might think about at first glance! Anything with “Extreme” in the name is probably going to have more than a few challenges, but that is part of what makes it fun! Thanks for the long and informative reply. Never having shot with a bipod and rear bag, I am not certain I understand the meaning of “taking the slop out of the bipod connections”? Does it mean that in bipods with spikes the two points of contact remain stationary and the bipod can rotate/move about these points Loading a spiked bipod means exerting enough shoulder pressure so forward rotation/motion of bipod is at the maximum. And the goal is consistency of shoulder pressure for every shot so that the rearward rotation/motion from the recoil is the same for every shot. I presume with the Phoenix you have to exert some shoulder pressure. And that you want the rear bag/stock interface to be as frictionless as possible as well as the bag being relatively incompressible? Great question. Sometimes I get so used to being around this stuff I probably throw in stuff that doesn’t connect. I just mean that bipods (like the Harris, Atlas, and others) usually have some play in the connections: attachment point, body, legs, feet, etc. When you push forward you can feel some slight inconsistency in the resistance. I just lean forward until it’s consistent. It’s still fairly light … maybe just enough force so that the rifle would stay against my shoulder if I removed my hands and the bag. And you’ve got it on the Phoenix and firm rear bag setup. That’s exactly right in my experience. I’m new to this kind of setup, but it seems fairly straight-forward and my results have been great so far. I am sorry we missed you at K2M we probably walked by each other several times. This is an update to some of the comments on the TACOM products. The actual travel of a Charlie is just over 400moa in one direction with a negative ability of at least 50moa. We note this limit as most barrels (32″ +/-) will start to come into view at the 400moa number. The newest updated Charlie is capable of well north of 800moa+/50moa- . It will also employ customer choices for materials involved. In order to work around the barrel issue a second product allows the Charlie to view down the side of the barrel (up to 2.1″ dia) . We have tested to beyond 18 degrees of shooting angle. This offset unit will work with any Charlie or could be modified to work with any scope. A smaller unit is in the works for any of those with high rates of fire and or cans. This unit looks around the mirage produced by the platform. For the 22 crowd we are working on a unit that is static with only one set value but at a lower entry cost. The turret… yes it has been some time. Yes- it is mechanically possible but the mechanics side has to be much more precise than a standard scope. We are producing the first “hard parts” at this time, but short runs on EDM’s is time consuming and a bit costly from a prototype point of view. The initial unit is capable of incremental movements to past 90mil- within less than one turn of the turret. Once that is in place we will review the possibility of what it will take to move to the full capability of the current Charlie. Our first customer goal for the adjustable unit is military and its capability is based on their engagement ranges . Hey, John. I appreciate you chiming in with the extra details. I noticed some of the specs on the website changed within a few hours of me publishing this post. What timing, right?! It looks like your product page currently says “The Charlie Tarac … adds zero (0) to 1,000 MOA (or 300 MILs)”, so that is what I updated the post to say. Are you saying that should be 800 MOA? Also, I’m intrigued by the “customer choice of materials involved.” Can you expand on that? And the look-around seems like a clever idea. It reminds me of the Leupold D-EVO, which uses mirrors and a look-around approach to provide both 1x and 6x magnification without having to move your head (watch video of it in action). Of course, your application is totally different. As we stretch out to extreme distances and our barrels are tilted up like cannons on a battleship … it would probably be easier to look around the barrel than try to get over it. And thanks for the insight on future products. I appreciate you prioritizing the military customers. While all of us would love to have better toys, those guys are the ones who need tools like this the most. The newest updated units will have 7075 in critical areas, increased surface areas for clamping and ground G8 washers. An upgrade option will be A2 for the adjuster plate. We had not anticipated the frequency some users would adjust the units and the 6061 fatigues at some point creating a “memory” position when trying to make minor adjustments. The 7075 is, as you know, nearly 2x as hard as the 6061 and with the use of the ground G8 washers adjustment is much easier. The use of the A2 is in another class by itself. The moa value- the 1000 is a true number, however we have always understated the units true capability. The turret version will have 8 user adjustable points. At least that is the goal. To date we can repeat any of those values typically within 1.5moa. 1.5 moa is a big value in today’s world , but, it is within 1.5moa at 10mil, 50mil, 90mil … a standard error within the system no matter what the range. We are working on improving that value but as you know all engineering is a compromise: precision costs money and potentially for me precision can be a liability in the field. We are not building a Ms Prissy field device. The current units can be cleaned in a bucket of soapy water and a can of Brake Clean and we would like to keep it that way. We will keep you posted as the newer products finalize. Thanks for the intel. I did read where you could clean the unit in a bucket of soapy water … that is pretty nice, especially for guys working in remote places. I appreciate the incremental improvements you’re making. Someone mentioned you’ve been able to upgrade older units in the past, which is really nice. Will you be able to retrofit older units with some of these improvements? Thanks Cal for an interest insight into what you see are the key drivers for optics on ELR platforms. I was very interested to see whether you had had a chance to see the GENESIS at KO2M and I am glad you were able to write about it. Unfortunately, 40% of the GENESIS article is devoted to your historical test of a March scope that has got nothing to do with the GENESIS and it really detracted from your review. I seem to remember at the time there was extensive discussions concerning what is a MIL and the internal workings of the March scopes in question and, as a result there was general agreement that your study would benefit from a review and corrections. If it helps for future reference, all March scopes are the same MIL measure and has been standard for years now but, as a result of the work you published, it seems to have become a default criticism. The actual adjustments are easily obtained from the Internet, not to mention talking directly with the three main dealers. March-F 3x-24×42 except initial scopes (the two prototypes you had) : 1/6283 MIL (I understand 6400 owners were offered a free adjustment at the time). I understand that the first production GENESIS scopes will be available to pre-orders soon. March dealers have explained via Facebook that extensive testing is occurring around the world to make sure the GENESIS works from the get go. This means optical testing and tracking testing happening in an optical laboratory then tested in field conditions and reviewed, in different seasons and different geographies. It would have been good for your readers if some of that was reflected in your review. In fact that could form part of a future blog post. The GENESIS is going to shake a few strong beliefs up and there will be some out there who will seek to denigrate new ideas because they do not understand them. 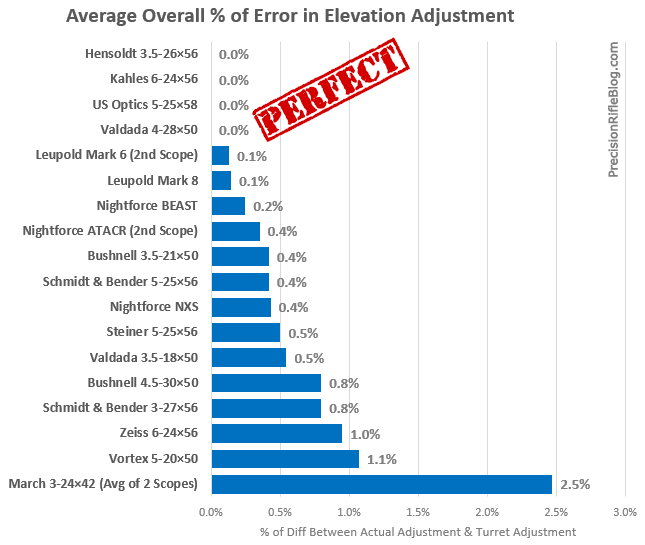 Running scopes at low powers is a default due to elevation travel running out – it has always been a band aid solution. Same applies to TARAC type devices – they solve part of the problem but and not the final solution because they introduce an additional variable into the firing mix. Moving forward, can I suggest it is now time to review your March work in light of 100s of very satisfied users and note the areas where enthusiasm would be tempered by experience? Frank Galli’s review of the March on Youtube (https://www.youtube.com/watch?v=Kig4NxSskQQ) would be a good starting point and I am sure Shiraz would be only too happy to step you through the current March range. That’s a fair critique, Richard. While I disagree, I appreciate the way you presented your point of view. I did try to reach out to Deon multiple times back when I did the test, and never got an email back. I also did talk directly to one of the largest US distributors of March scopes at the time about the tracking discrepancy I measured in my tests, and they didn’t offer any insight into the issue. They couldn’t explain what was going on, and assumed there must be something wrong with that particular scope, so they suggested they send me another scope to test … which had the same problem. And it wasn’t the issue with the 1/6283 mil vs. 1/6400 mil. I’m VERY familiar with that nuance, … but one of the two scopes I tested was in MOA! The 1st scope I tested was in MOA, the 2nd they sent me was in mil … both showed very similar tracking error. I know some people can get really defensive when someone says something bad about their favorite brand, but all I did was publish the truth of what I measured. I tried to be fair with the manufacturer by reaching out to them directly, but they never replied. I did reach out to a major distributor, and they seemed just as confused about it as I was. As I understand it, the guy who makes those scopes is a good guy … so I hate that the test turned out the way it did. But I had to publish what I found. That is just an integrity thing to me. I honestly wish all the scopes would have tracked perfectly, but they didn’t. Publishing poor results like that is the hardest part for me about doing data-driven tests like I do, but I’m committed to publishing exactly what I measured. 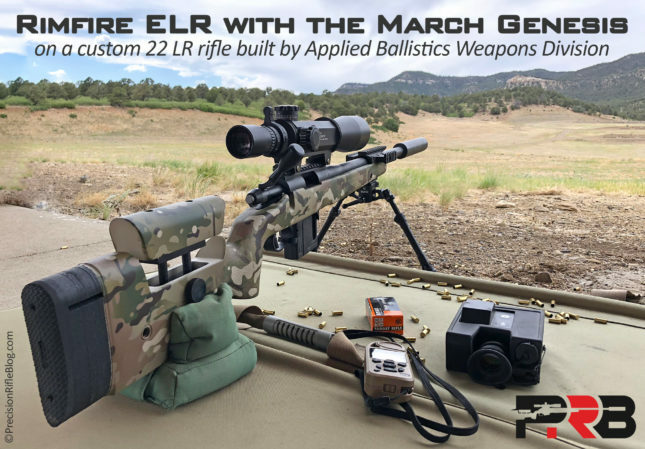 I’m hopeful March has addressed the tracking issues I ran into a few years ago, because the March Genesis scope offers some compelling features for ELR. I also personally love seeing someone bring a novel product to market, so I’m hopeful they succeed for taking a risk to better serve ELR shooters. I fully expect other scope manufacturers to head down the same path in the near future, so thanks March for blazing a trail! And I’m sure there are lots of guys that love them. Honestly, the ergonomics of the March scope I tested might be my favorite from any scope I have ever tested. The dimensions of the turret and feel of the clicks are my personal favorite to this day. And one point to keep in mind is the tracking issues don’t even matter in shooting disciplines where you get sighters. If you are shooting a bullseye at 300 or 1000 yards and you are two clicks low on your sighters, just add 2 clicks and move on. Who cares? The only time it matters is when you need first round hits on targets at varying distances. And even then, most advanced ballistic solvers can correct for an error like this, but it just adds one more layer of complexity to what you have to manage. The biggest problem is people don’t test this stuff. They just know their solution doesn’t line up with what they have to dial on their scope to get impacts, and then they question the solver, or the BC, or the muzzle velocity … but they don’t think to question the scope. Richard, I appreciate you stating your view of this. I can tell you’re a smart guy, because you have had a lot to add in the comments over the years. And now I’ve stated mine view. I’m not going to go back and forth in the comments with guys about this, but I hope you understand. I do appreciate how you presented your perspective. I rarely respond to negative comments about our products and the couple of times I did was to specifically to lay out facts. I suppose it should be a honor that invariably a strong March proponent or representative makes a negative comment, indeed I ran straight into that at K2M, which means they consider us a strong competitor. In defense of Cal- he writes one of the most straight forward factual articles in this arena that exists. You note an added variable: variable in this case is a potential failure mode specifically POI. However, variables in this case start before POI. 1) We have had one field failure to date. A series of screws where removed and not put back into their correct position. Once the offending screw was removed the unit was dead spot on its base setting. To note this unit has been on dozens of rifles in field conditions for 2yrs. 2) One unit (70mil) was claimed to not work (at all). Though we spent 8 hours testing it, and then sent it out to a third party and shot on two platforms (6mm and .375) with exact results. The other big stated issue as noted by a March representative – ” I would never put that thing on the end of my scope. I spoke to the designer and he said the same thing…” The fact is to date we have not been notified of one failure of a scope- though one unit might of been cross threaded onto the scope- and we have clearly noted we do have a divorce mount for those concerned that does not need a rail. However we have produced adapters for every major scope, I believe, all the way down to 44mm units. As you know we are using a simple law of physics for alignment- indeed the unit is very forgiving in its mounting- left, right, up, down and distance from scope (which could be 15″+) and is only sensitive to cant by the formula : unit offset/90. So we can drop that variable. I assume by your note you have indeed used our unit by which you also know your head, eye, and shoulder do not change position. Another variable that can be eliminated. Comparing variables in the two units: our unit can only fail due to a rod breaking loose or an optic breaking loose. Concerning the optic mounts- we have not found a way to break one loose without destroying the glass and or aluminum. To note: I produced glass components for industry that had to meet automotive, food, medical, and defense standards for three decades. The gimble assembly is a great work of engineering and certainly more complex than our unit. Complexity most often adds failure modes- lets compare a FMEA. It is also fairly common to note that as we double a “distance” and require the same results the effort to achieve such results are not typically 2x ie… elevation travel. Mainly line of sight. The scope cannot be used to its full capability without a riser block. Even the YOU TUBE made in Europe clearly shows the scope pointing at the barrel. How much riser block, cheek block and shoulder adjustment would be needed to look over a 35″ barrel with the noted scope? When you adjust the scope your head will have to move, cheek will have to move, shoulder will have to move. As you well know platform control issues increase rapidly with caliber and recoil. Without platform control – you don’t win. The turret version indeed incorporates many of the potential failure modes the Genesis does- moving parts. It is capable of more travel than the Genesis and capable of that adjustment in less than one turn, all without moving your shooting position, for less money, and is transferable to other platforms with an adapter. It will make any scope, with zero elevation capability an instant 300moa capable product. I have found that most negative comments come from sources who have not used our product I will assume you have in order to note a “Band Aid” fix. I am just not sure which wound the Band Aid is trying to fix. I apologize if this offends you as you are a bit on the tail end of a couple of months of negative statements about our product, including to groups of competitors, and I am finally responding. I will note clearly – again – I think the March unit is spectacular in many ways and hats off to their endeavors and success. Market choices are good for all of us. but really great work thanks for sharing! You bet. Honestly, I’d love to read about some of that testing myself, both details about how they’re doing and the raw results. I hope they track true, because I may buy one personally if I can see data from a reliable third party showing they track. It is a compelling product. Many years ago i shot Police PPC competitions with a heavily modified Smith and Wesson K frame revolver. In addition to the heavy barrel it had an ARISTOCRAT sight. On the right rear corner was a three position cog…that moved the rear sight blade up or down based on my 7, 25 and 50 yard settings. I could adjust it with a small Smith and Wesson rear sight screwdriver in my pocket between distances. Perhaps a scope base designer could make a base with a similar cog system…that would elevate the rear of the base to 10-20-30 Mils (or whatever values) were preferred and used in concert with scope turret adjustments.. It was simple and reliable. An interesting idea, Doug. I’m not familiar with that sight system, but this kind of problem is relatively new to precision rifles … so it only seems right to look for inspiration from other places. I know a lot of smart people in the industry read this blog, so who knows … one day you might see a product like that and go “Hey, that looks familiar!” 😉 I appreciate you chiming in to share your thoughts. More of a question about your previous post regarding your ELR rifle. You said you are able to swap barrels with that action between the 300 norma and the 338 Lapua. How are you able to do that? I am very interested in the Bighorn Arms TL3, mostly because of the ease of barrel swaps. How does the process for your Surgeon action compare the the TL3/barrel nut style actions? Thank you so much. I really love your content and have learned a ton. Thanks for all you do. Hey, Nate. Great question. The barrels were all chambered for that action. The 338 Lapua barrel came on it when I bought it, and I sent the action to another gunsmith and he chambered the two 300 Norma Mag barrels to headspace on that specific action. Now all of those barrels are chambered for that exact action, so all I have to do is spin them on and tighten them down. They headspace off the shoulder of the barrel, without needing any kind of barrel nut. I’m not saying that is the best way to go, because the benefit of the TL3/barrel nut is that you can order pre-chambered barrels without sending off your action. Because the barrels aren’t chambered for your exact action, they can be mass-produced for any action … which means the price will go down. I’ve seen places online where you can buy pre-chambered barrels for not much more than what a barrel blank costs, at least for popular actions and chamber specs. You will just need to use headspace gauges to tune the headspace yourself and set the barrel nut appopriately, where I just spin the barrels on and tighten them down. Hope that helps, Nate! The Big Horn actions are really nice. I’ve almost bought one a couple times in a long action, just to build a rifle that would make barrel swaps really easy. They are outstanding actions, and that kind of setup is a way to get a top-shelf rifle in multiple cartridges without breaking the bank. So I’d stay on the path you’re headed down. It’s a good one! not true MOA at 1.047 inches , which would explain the old test error . Can you do a test of the Genesis for us ? forward to reading about more advancements in ELR shooting . I’m not sure if there is an adapter on the Genesis or not. A Charlie TARAC might be overkill on something like that, unless you were shooting to the moon! Unfortunately, I don’t have a Genesis, and at this point I’m not sure I want to be the guy to test it either. If I publish that it doesn’t track properly, there are guys that would argue with the results (just like you just did by claiming it was the 1/6400 and 1 inch/100 yards that “explains the old test error”). I’m not going to argue about it any more. The results are what they are. I’d love if someone else (who is objective, detailed, unbiased … and willing to dedicate the time to set it all up and run the test) would test the Genesis and I’d be happy to read it. I honestly can’t remember how much we were dialing that day at the Whittington Center. I should have written that down, but didn’t think about it. It was quite a bit … enough that the suppressor on a relatively short barrel got in the way of the field of view! Glad you’re enjoying the content. I’ve already been working on the next couple posts, so stay tuned.